by Will Mueller Milwaukee Habitat for Humanity (MHFH) moved its headquarters to Riverwest, 3726 N. Booth St., on April 15 and is currently building eight new homes in the adjacent Harambee neighborhood. MHFH moved its headquarters because their previous building, located at 2233 N. 30th St., was deteriorating, and because they needed more usable space for construction preparations and storage. Currently, MHFH is building 35 homes a year in Milwaukee neighborhoods: 20 new construction in Park West and Harambee, and 15 rehabbed condos on Milwaukee’s Northwest side. “We will break ground on our 360th house this spring,” said MHFH Development Director Melissa Herguth. “We have built or rehabbed over 350 homes in the Washington Heights, Metcalfe Park, Park West, Walnut Hill, Harambee, and Woodlands neighborhoods.” Energetic Undertaking The eight homes in the Harambee neighborhood are on 5th and 7th Streets, just north of Locust Street, and will be partially energy self-sufficient. “We got a grant from WE Energies and Focus on Energy to put solar panels on all 20 homes this year,” said Herguth. “We are also planning on making our warehouse as energy efficient as possible by installing new windows, compact fluorescent lighting, and solar panels on the new garages we are constructing.” “Habitat is working to provide affordable homes for lower income families,” said Carl Siegrist, Solar Programs Manager for WE Energies. “It seemed only natural for us to work together.” By working together, MHFH and the home’s future owners will save on costs while WE Energies can provide training and education opportunities for their staff. “We have offered to provide financial support to purchase much of the equipment needed for these solar systems,” explained Siegrist. “By doing so, we will hope to be able to increase customer awareness of solar energy and develop the workforce that will be needed in the future.” DIY Homeowners While WE Energies workers are learning to install new technology, future Habitat homeowners are learning how to build, and even building much of their new homes. “Habitat is not a giveaway program,” said Herguth. “In addition to a down payment and the monthly mortgage payments, homeowners invest hundreds of hours of their own labor – sweat equity – into building their Habitat house and the houses of others.” Requirements to be considered for becoming Habitat home owner include being a family in need of affordable housing (must fit income guidelines), be at their current job for more than a year, be able and willing to work 500 hours on planning, preparations, and building, and have a fairly good credit history. One Happy Homeowner Carmel Ramsey’s application to become a Habitat homeowner was one of eight selected out of more than one hundred submitted to MHFH. “I knew I couldn’t get a house the traditional way,” said Ramsey. “I knew I couldn’t pay $1,000 a month.” Herguth says that the average mortgage payment for Habitat homeowners is around $475. Ramsey decided to apply to MHFH for housing after knowing people who went through Habitat to get their homes and after reading Habitat’s Mission: Milwaukee Habitat for Humanity is a non-profit homeownership ministry building simple, decent, affordable housing in partnership with people in need. “I’m going to be more appreciative because I know I helped build this house,” said Ramsey, who will live in the home with her 14-yearold son. One Dedicated Volunteer Ramsey’s home and others in the Harambee neighborhood are being built not only by their future owners, but also by dedicated volunteers like Bob Patton, who has been volunteering regularly since 2000. Patton, a MHFH Board Member and House Leader, is a retired math and computer programming teacher from Homestead High School and started volunteering with MHFH through his church, Crossroads Presbyterian in Mequon. “Our church has been involved since about 1990,” said Patton in front of the Harambee home he and a group of volunteers were constructing. “About one third of the people on this house are from Crossroads.” MHFH does not require that volunteers have any previous construction skills, but are in the greatest need of experienced builders (or ones willing to be trained) willing to become House Leaders and to lead groups of volunteers during blitz weeks when MHFH frames five to eight homes at a time. Lots of Supporters “We have lots of long-time volunteers, people who have been with MHFH since the beginning (1984),” said Herguth. 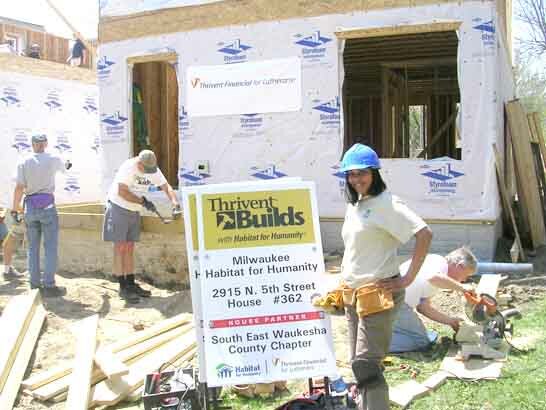 “But sponsors like Northwestern Mutual Foundation, Sargento Foods Inc., Lowes, Milwaukee Electric Tool, and our church coalitions have been great supporters of Habitat by providing both funds and volunteers.” Over the last two years, Thrivent Financial for Lutherans has been MHFH’s major sponsor. According to Herguth, Thrivent is sponsoring ten homes this year, which adds up to $600,000 in donations this year. Thrivent also sponsored ten homes between 2006 and 2007. MHFH is able to purchase vacant lots from the city for anywhere from $1 to $500. This saves MHFH money which can be spent on building homes and provides Milwaukee with another property-tax payer. Check Out the ReStore! MHFH is not only building affordable homes through donations, volunteers, and help from the Milwaukee, but now has a Habitat for Humanity ReStore in West Allis which sells affordable building materials donated by manufacturers, retailers, contractors, and individuals and sells them to the general public at an average cost of 75% less than at local retailers. Habitat says the ReStore is one of the ways that Habitat is “going green,” boasting that the West Allis ReStore has diverted over 180 tons of construction materials from landfills. The ReStore is located at 801 S. 60th St.